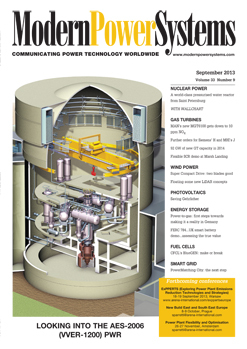 The international monthly magazine Modern Power Systems provides in-depth independent coverage of power plant and transmission and distribution technology. Widely read throughout the world of electricity generation, it specialises in presenting key engineering and commercial developments in an authoritative but accessible style. From advanced power plant and transmission design to repair and maintenance case studies, Modern Power Systems is unrivalled as a platform for exploring cutting edge developments in the power industry. It is sent to over 11 500 carefully targeted management and senior executives responsible for the planning, specification, purchasing or operation of power generation, distribution and transmission systems or ancillary equipment in over 120 countries worldwide. The readership of Modern Power Systems is concentrated in major energy planning and producing organisations, power supply utilities, government power planning departments and consulting / architects engineering concerns as well as industrial producers of electrical energy and users of private generating plants. Modern Power Systems' circulation is independently audited & verified by The ABC (Audit Bureau of Circulations).